Our Modern Electronic Cigarette is patented and this diagram is showing a comparison of our competitors’ version of the Electronic Cigarette atomizer and cartridge commonly called a cartomizer. Above is our Patented Modern Electronic Cigarette’s tankomizer with a 100% sealed tank cartridge design. The E-liquid in the tank cartridge stays pure which is much more hygienic (medical and GMP standard). It will not mix with heated wires and soldering points which contain lead and the E-liquid does not come into contact with any chemical fibers, sponge or chemical insulating materials and does not have contact with the steel shell (the nicotine and e-liquid would react with iron in the steel shell like the cartomizer) therefore not becoming contaminated by those harmful materials which can be dangerous to consume or inhale via vapors. This can be a very serious health issue. The Patented Modern Electronic tank cartridge is a unique design, which the keeps E-liquid very pure, with a 100% sealed in tankomizer and will increase the shelf life of up to 3–5 years. Our Competitors’ Electronic Cigarette cartridge called cartomizer (see below) has a shelf life of only a few months. 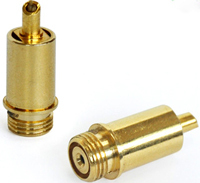 Our Competitors Electronic Cigarette atomizer and cartridge together or called Cartomizer (please see below the design of the internal structure). The connected wires, heater wires, soldering points (which contain lead), chemical fibers (polyethylene terephthalate, ethylcellulose), sponge (nitrocellulose, polymer foamor) and chemical insulating materials are all marinated in the E-liquid at point of manufacture and the steel shell is made of iron which can react with Nicotine and other chemical materials in E-liquid which can take a considerable amount of time. The E-liquid becomes contaminated by above mentioned chemical materials and by the heated material with heavy metal elements including lead which can be dangerous to consume or inhale via vapors. As we know the e-liquid is very active and an unstable liquid, especially if it contains nicotine. Our Patented Modern Electronic Cigarette’s tankomizer will give constant dose from first to the last puff which is required medicinal license authority. But our competitor’s (Ruyan’s) design cannot give constant dose at all, if the first puff is as 100%, but the last puff only has 1%. And it also wastes up to 30% E-Liquid due to the sponge and chemical fiber always contain E-Liquid at the end even without the vapor. Current market all other disposable electronic cigarette, electronic shisha, rechargeable electronic cigarette with cartomizer use above mentioned our competitor’s (Ruyan’s) design. The illustrations clearly highlight that our Patented Modern Electronic Cigarette design is pure and clean and that in contrast with the competition it is outstanding in its field.